Avalanche tries its hand at four-player co-op. 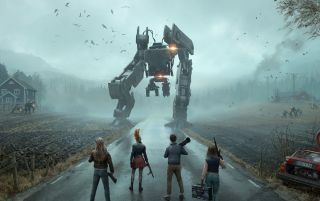 If you enjoyed the scary Black Mirror episode 'Metalhead', where Maxine Peake's character is chased by a killer robot dog for ages, you'll like the basic enemy types in Avalanche's Generation Zero. They are a similar kind of mechanical enemy, if less sleek, and a lot easier to kill than they were in Netflix's anthology. And they are by far the most exciting part of this four-player co-op shooter, based on my 25-minute demo. This FPS is set in an alternate reality '80s, which in this demo seems like a pretty unnecessary detail outside of a few wacky player cosmetics. Four young friends go exploring a Swedish archipelago, and after their boat is attacked, they're stranded in a place where all the people have vanished, and only these angry robots remain. This is an open world game, but it's a deliberately sparse setting. I mostly just see houses, abandoned cars and fields—there are no cities. The demo is set on one island at the bottom of the game's map, and it has me and another player (one of the developers) following clues and looking for signs of survivors. It's like if Everybody's Gone to the Rapture was set in Sweden, except instead of no one you had evil robots. The developers don't call them mechs, they call them 'tanks'. There's a variety of them: the aforementioned dog-like enemies, some little flying drones, these tiny things that jump at you like frogs, and a gigantic-looking mech that appears right at the close of the demo. They wouldn't reveal how many types are in the game, but aside from their visual design, there's a few things I like about them. Their appearance is flagged by red scanner lights. The game has a dynamic weather system, so in heavy rain, it's pretty spooky to see these red lights blinking in the distance. The rain apparently makes it harder for them to see the player, too. It's more a co-op shooter than anything, but it might remind you of survival games as you'll constantly rummage through houses and empty cars looking for supplies. You'll usually be seeking out health items, ammo or flares, the latter of which can lure an enemy into a handy location so you can pick it off. Rifling through the remains of enemies gives you devices that you can use as EMP grenades, which scrambles them long enough so you and your buddies can land a few shots. It's not a complicated shooter based on this demo, but I like fighting enemies in open spaces with only occasional cover, using the few supplies I have to make shootouts easier on myself. The armoury in this demo offers a pretty basic range of pistols, machine guns, shotguns and a rocket launcher near the end, when loads of robot dogs ambush me outside a house while I pick them off from a balcony. They've simulated elements like recoil and ballistics, though strangely there doesn't seem to be a melee attack, so there's little hope of someone murdering every evil robot dog in a fistfight. There is a range of ways to upgrade your character across combat, support, survival and tech skill trees, and you can't activate every node with one character, so that'll hopefully encourage some tactical synergy with friends. There are a few other curious elements at play here. Damage an enemy, and the game will remember how much of its health you depleted, even if you come back to the game weeks later. This doesn't mean there's a finite number of enemies in Generation Zero's world, though. While the combat seems simple and the overall feel of the game is mostly familiar—the atmosphere of these flat, quiet green spaces reminds me a little of Arma—its set pieces can get nice and busy. With three friends, I can't see how it won't be enjoyable on some level. Generation Zero will cost $35 at launch, which feels about right based on what I've played, and there's a beta coming down the line. I'm not convinced it'll join the growing pantheon of great first-person co-op games on PC based on my first impressions, but having enemy types that look this cool is a decent hook.